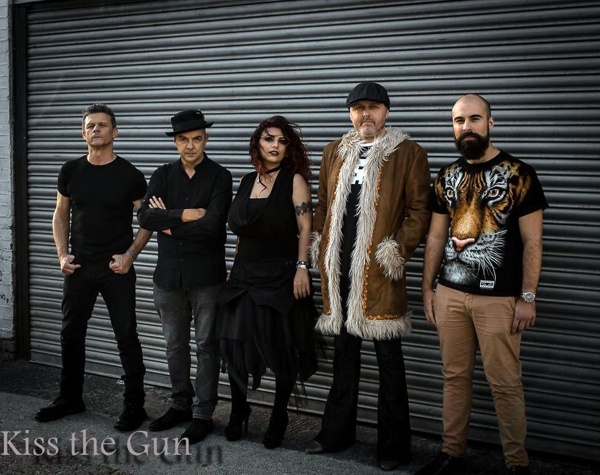 Kiss The Gun are a new five piece Melodic Hard Rock band featuring four veteran UK musicians and female Georgian vocalist Nadin Zakharian. Their debut album was the rapid result of this new international collaboration, which was well received by Fireworks Magazine (read the review here). James Gaden chatted with vocalist Nadin and bass player and chief songwriter Dave South to hear more about the band. All the guys in the band have been playing for quite a while, Nadin has been singing in her home country of Georgia, so how did you all end up coming together to form Kiss The Gun? Dave: I had been playing covers in another band and co-wrote a song called 'Tainted Heart' which I decided to put on Facebook, just to see what people's reaction was to it. It got picked up by a record label called 3Ms, who wanted us to go down and record and EP. There was only me and one other guy at that point, so I had to form a band around us both, which I did using a couple of members from Tokyo Blade. We went in and recorded the EP, which did quite well and 3Ms asked for an album. Unfortunately the guys from Tokyo Blade couldn't commit, so I had to form another new line up. We brought Nadin in and we made the album. That's quite an old school way of doing things, having a record label hear a demo and offer you a deal, not many labels do that nowadays, usually you have to contact them, or basically already have the album made using your own money. Dave: Yeah, exactly, it came out of the blue actually. It was a spur of the moment thing, I never thought anything would come of it, but there you go! So who sang on the original demos? Dave: I did. The guy who owns the label is a friend of mine anyway, which helped big time, but I hadn't heard from him for years. He told me he had taken on this label and had some good artists on his books and asked if I wanted to work with him, so I jumped at the chance really. How did you enter the picture then, Nadin? Nadin: Ah, that was very interesting. Dave found me on Youtube, I was doing covers of some Rock and Metal songs, he contacted me via Facebook and he thought I was living in the US, because it said Georgia on my profile, but it's not the state of Georgia, it's the Republic! (laughs) It was quite an relief for Dave because Georgia is a lot closer than the US! Dave sent me the first song which was 'Into The Fire' and he asked me to record a vocal for him. I sent it back and they weren't sure at first, but after the second song, which was 'Nightmares', I managed to convince them to be their vocalist. You had some singing experience in your home country because you'd done some TV shows, is that right? Nadin: Yes, I was on a talent show in 2011 and on 'The Voice Of Georgia' in 2013, I made it to the live shows and the semi-finals on those. Once Nadin joined the band, how long were you together before you started recording? Dave: A day. (laughs) We had one rehearsal with the whole band – the rest of us had rehearsed the songs anyway, but we only had one actual rehearsal with Nadin before we started to record the album. She knew all the songs anyway, it was just a case of tightening things up a bit. Nadin: I just listened to the demos and remembered all the lyrics and melodies, when I came over I was just about ready but it was tough. Had you any recording or studio experience before, Nadin? Dave: She hadn't been in a big studio before but she did a great job. Nadin: It was hard for me to get used to singing with a live band after being used to singing to the demos, with programmed parts and not a real group of people. You wrote the bulk of the material Dave – how do you present the songs to the band, are they fully formed songs or just skeletal tracks for people to add to? Dave: I normally do a whole track but if anybody has any ideas, they are free to add parts. That goes for anyone in the band who writes a song, if somebody has got something to add it's welcomed. Gerry [Hearn, guitars] put some great stuff on some of these tracks, he's really done us proud with his playing, especially the solos, they're just brilliant. Who are your influences Nadin? I thought you sound a bit like Amy Lee from Evanescence? Nadin: My family is very musical, my father was a Jazz man and played trumpet, he was a composer, he sang, he was in love with music so that inspired me. I wanted to make him proud. I started working on my singing from a young age, I love lots of singers, from the vocalists in Blind Guardian and Shinedown to Adam Lambert. And you Dave? There's all sorts of things in this music you write, some quite Hard Rock stuff with some very Melodic Rock keyboard parts, where are you influences drawn from? Dave: I like all sorts of genres. I listen to a lot of R'n'B which may sound strange but that is often where I'll get my melodies from. I like loads of Metal, I grew up with Judas Priest and Rush, I go back quite a way so all that is in there. Even though you've not been together very long, the debut album is self produced, you didn't bring anybody in to oversee things. Thats unusual isn't it? Dave: It's just how it turned out really. I knew how I wanted the songs to sound, the guitar players knew what sound they wanted, so we thought we'd just do it ourselves. The guy who engineered it, James Patrick, he was brilliant anyway, he was on our wavelength and knew what we were after, so he made it a lot easier to do it ourselves. Have you have chance to play live? Dave: We've done two shows, it's difficult at the moment with Nadin being in Georgia, but we did a show in Southampton and one in London, both of which went down really well. We're hoping to tour next year. But as things stand, Nadin is having to fly back and forth? Dave: Yes, it's a bit of a problem but we'll get over that. If we can line a tour up we can get her over here to do things right, we've got management interest now so we're optimistic. Do you sing full time now Nadin? Nadin: Singing was just for fun, for leisure at first, but it is becoming more and more my actual job, which is great! I saw you also have a good video out as well to help spread the word. Dave: Yes, we've done a live video too, but I'm not sure when that's coming out. We'll keep everyone posted on Social Media, but it's up to the label. We shot the videos while we were working on the album, so we actually recorded the whole album and shot both videos in five days... which was a task in itself. That's why we were well rehearsed! We recorded most of the album live and then just overdubbed some guitars and the vocals, so most of what you hear is live. These three reissues, endorsed by Tom Galley, are the definitive ones. Fireworks Magazine #86 is out now!